Framed size 69 x 43 CM. Signed on the back of board. Oil on board with copper leaf. 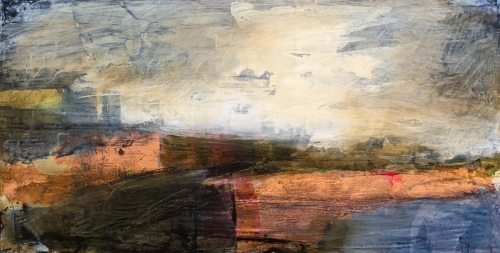 Henrietta Stuart paints abstracts in oil on canvas, based on 'things seen': formerly still life, now mostly landscape, in which she aims to evoke time and place, using colour and light. She paints in thin layers, laying paint over paint to exploit its transparency, a technique of which both Turner and Titian were masters. Her formative influences included Georgio Morandi, Paul Cézanne, Georges Braque, Mark Rothko, Robert Motherwell, and Clyfford Still. Morandi is remembered for pointing out that "There is nothing more abstract than the visible world". Henrietta sets out to make abstract compositions out of things she has seen, and been moved by: "A world observed and translated - a world created from the natural and the man-made: 'still life' a still life both drawn and felt, as one would admire and caress a well-loved jug, or wonder at the light on the water of the Thames on a calm spring morning" - was how she put it myself some years ago, and it still holds true.